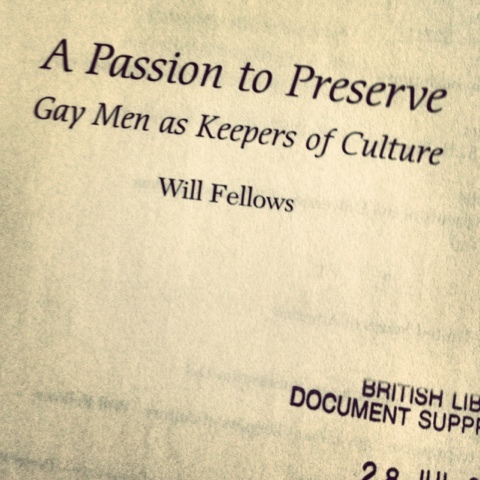 Fellow, W. (2004) A Passion to Preserve: gay men as keepers of culture. Wisconsin: University of Wisconsin Press. It’s a really interesting read, perhaps a bit reductive and stereotyped at times, but it’s basically a collection of case studies about collectors/preservationists who are gay men. He identifies patterns in the attributes his subjects possess, namely; gender atypicality, domophilia, romanticism, aestheticism, and connection-and-continuity-mindedness, all of which he explores at some length.